Written by Jin Won Choi on Nov. 24, 2017 in Interviews. Last update on Nov. 28, 2017. The following is a transcription of my phone conversation with Cato Pastoll, the CEO of lending loop. Lending Loop provides an alternative investment opportunity for Canadians. The contents have been edited to enhance clarity. Jin: Could you start by telling me about yourself? Cato: Yes, sure. My name is Cato Pastoll. I’m the cofounder and CEO of Lending Loop. We are a peer-to-peer lending platform. Essentially, what we do is we connect individuals, so people like yourself and myself, with small and medium sized businesses that are looking for financing. So, when a business wants a loan they’ll apply for financing through Lending Loop. We’ll review that loan, and if we approve it, we’ll post it online for our community of investors to view those loans and decide if they want to loan to those businesses. Jin: How long have you been going as a company? Cato: We’ve been working on Lending Loop for about two and a half years. We got our regulatory approval in October 2016, so that’s when we became a registered dealer in all thirteen provinces and territories of Canada. A lot of the work before that was working towards getting that registration status and we are currently the first and only regulated peer-to-peer lending platform in the country. Jin: By my calculation, then – did you work on getting registered for a full year? Cato: Yes, it was probably around a year – just under that, I think. That was for the actual registration process. We actually did run a short beta kind of pilot from Sept 2015 to about March 2016. Jin: Before you were regulated, did you open yourself up to just accredited investors? Cato: No. We have been open to all investors since day one. Peer-to-peer lending, or the concept of peer-to-peer lending, is really best tailored to be democratized in terms of being accessible to anyone. And, myself and my cofounder really from day one wanted to make this type of asset class, this investment, available to all investors, regardless of how wealthy they were. It was really important to us, so, we’ve always accepted any investor type, and we’ve never been restricted to just accredited. Jin: The regulatory perspective is interesting because, like you said, most peer-to-peer lenders can only take money from accredited investors, so: rich people. How were you able to get over that regulatory hurdle? Did regulation change in Canada or did you just have to—? Cato: As I mentioned, we were the first ones ever to get approval to do that. I think there is definitely a movement towards more innovative thinking in financial services generally speaking. When you look at how successful it’s been, for example, in the UK, or Australia, or New Zealand, where it’s opened up to all types of investors, I think there is a very clear case to be made as to why this is a really great investment that should be available to any investor, regardless of their income or financial situation. So, I think there is a really strong case to make it available. And, I think that we were just knocking on the right doors at the right time, I suppose is one way to put it, and it was part of our our mission since day one to make it available to all investors. We didn’t want it to just be a platform for only accredited investors because we really believed that these loans, this asset class is a really great asset class. I wanted myself, my friends, my family to all be able to invest as well. Jin: Do you invest your own money through Lending Loop? Cato: Oh, yes. Absolutely. In every vehicle. Jin: Did regulation change then to facilitate that in Canada? Cato: The regulatory framework is still the same. There are infrequently advances in regulation. So, there wasn’t something that changed specifically for peer-to-peer lending. We still don’t have a peer-to-peer lending framework, rather we just kind of put the work in evidence to be approved, to be able to do it in Canada, and no one else got approval to do it before us. Jin: Could you explain how Lending Loop works at a high level? Cato: Essentially the way Lending Loop works is we have an online platform where small businesses can apply for financing from us. When a business applies for a loan we review that loan to ensure that that business is creditworthy. If we deem them credit worthy, we will post them on our Marketplace where investors can view the loans of those that are seeking financing and decide how much they want to lend to those businesses. Investors can lend as little as $25 in individual loans, and really what that allows investors to do is to build a very diversified asset class of small businesses from across the country in many different industries and different geographies. 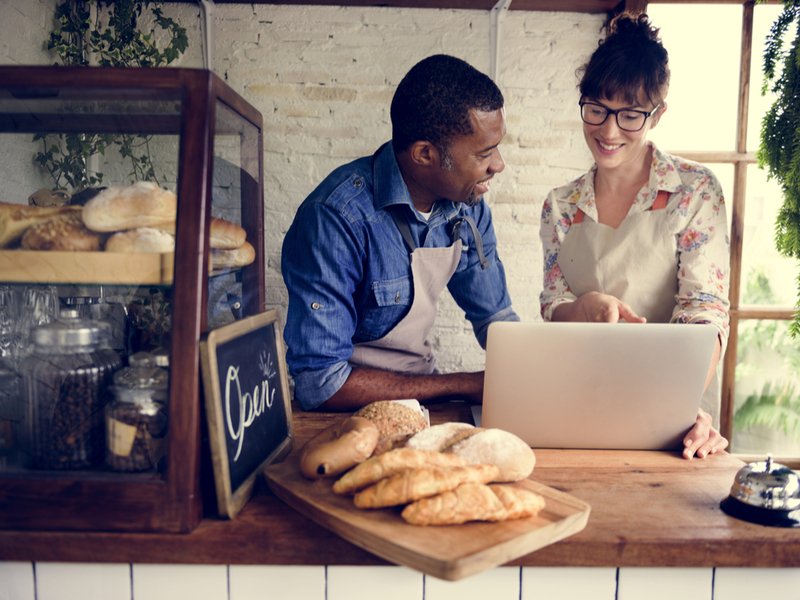 If you think about it, with an investment of say $2,500, you can invest in 100 different small businesses through Lending Loop and build a very, very diversified portfolio. So, really, the concept of Lending Loop is making diversified fixed income investing available to everyone. Once you invest in a loan, you will receive monthly repayments of both interest and principal, similar to a mortgage. The month after you invest, you actually start to see a return right away on your initial investment. Jin: I’m trying to get a good sense of the mechanics of everything works. So, when a business applies for a loan –say they want $10,000– it first goes through your credit review people and then gets a rating assigned, and then, does it get put up on some web board for people to contribute money to? Cato: Yes. Essentially, once it’s approved by the credit review team, which is a process in itself, it then gets posted on our Marketplace, which is entirely online, and, then, investors can go on the Marketplace and look at the different loans that are seeking financing. There’s two different ways that you can invest. One is by investing directly through picking and choosing loans. So, you may see: here’s a local coffee shop I like – they’re paying 10 percent interest over three years. And you might like that loan. Or, there might be a different loan: a local yoga studio that’s over four years and paying 12 percent. And then, you can pick and choose the loans and the amounts you want to invest in those specific ones. That’s one way of investing, and it’s how many people invested when we first started. A new feature that’s started quite recently that’s been very popular is something called Auto-Lend. Auto-Lend allows you to set criteria. So, you can say, I’m looking for only high-risk businesses, or, I’m only looking for low risk businesses with a kind of target retirement profile. And then our technology will automatically lend the users money for them. So, let’s say, you want to invest $200 every two weeks because, maybe, you have $200 of savings from your pay cheque every two weeks. You can kind of set the system up to debit the money from your account, then lend that money out for you, and so you can build a portfolio of small business loans without having to do anything–just kind of investing on autopilot. So, there’s a lot of our users who do the manual investing, some of them do Auto-Lend, and there’s a lot that actually do both. So, they do the Auto-Lend solution and they also go and view specific loans and pick other ones that they want to lend to, or want to lend more money to. Jin: What happens if a business doesn’t get all the money that they requested? Cato: There’s a few different things that could happen. One of the things that could happen is that if we think that the business could use a smaller amount than their initial request, let’s say, it’s for working capital, or for an inventory purchase. Let’s say they were looking for $100,000, but they only raised $50,000, and we think that $50,000 is still going to help them get the inventory that they need, we can still advance them a smaller amount than their initial request. Alternatively, if they needed the entire amount, we could either extend the the funding period, or if they completely weren’t able to get the financing, then we would cancel the loan and then, obviously, all the money would be returned to the investors. Jin: Now you mentioned that your credit review people assign a rating to each of the businesses. Could you talk us through how you go about doing that? Cato: That’s one of the most important parts of the process here at Lending Loop, and one that we’ve been building for the last two years. One of the really cool things about what we’ve been doing is you can use technology to make that process more efficient. Our technology looks at one hundred different data points that we collect from a variety of different places. So, that will be from the business’s financial information; it’ll be from their loan application; it’ll be from credit information, both their personal credit information and the business credit information. And we’ll use all those different data points to analyze the risk of a particular business and to understand whether or not they’re creditworthy to apply for a loan. There’s actually technology that will build an automated credit score that assesses the risk of a business. Once that’s done, we then have an actual underwriter, a physical human, who will take a look at the loan (look at the financials) and analyze such things as coverage ratios, debt service coverage, and assets to liability ratio to ensure that all the financial information checks out, and, at that point, if they’re happy with their review, they will then sign off on the automatically-generated credit rating. So, it’s kind of a two-step process. One is really heavily data-driven, using all the technology, and the second is a manual review by a human underwriter. Jin: It sounds like you are applying machine learning on the credit data points to come up with ratings. Is that correct? Cato: Yes, exactly. We do use machine learning. We have a few different data sets as well that we’ve compiled over the last few years in order to make that as accurate as possible while we’re training the models, and, of course, the other great thing about that is that is that our models are improving consistently. So, all the time we are actually getting better and better at how we score and evaluate people. Jin: I know a little bit about machine learning – I actually did some of it myself. And the big challenge with machine learning, of course, is the data that’s required, and, as a young company, you’re acquiring even more data every day. But, I’m assuming you don’t have tons of data. How do you fill that data gap? Cato: There’s a lot of different ways you can fill it. If you’re familiar with machine learning, I’m sure you know some of the techniques and methods that you can use to do that. But what I’d say is that where there’s missing data, we try to make up for it with other things–either by generating other data sets, or by making things a bit more modular in terms of the way that we’re doing it. So, we don’t have a giant database that incorporates all of the different pieces of credit information that’s required to come to a decision, but rather the pieces of data sets that we do have, plus the data that we collect from the business is stuff that we can test and evaluate with. We also do have a variety of different databases that we’ve acquired over the last couple of years. Partially, it’s from things like credit bureaus and other such sources. So, we do have quite a vast data set. Also, we’ve had more than a thousand loan applications actually on the platform since we first launched–so, we did have quite a large variety of actual applicant information that’s come through. Between all of those different things, we essentially have our own proprietary way of being able to evaluate and score that data. Jin: Just so you know: my audience–a lot of them tend to be programmers and engineers, so a lot of them, they tend to be interested in this type of subject area too. Cato: That’s very cool. I’m obviously managing more on the sales and operations side. But, my cofounder and the R&D team manage more of the actual data side of the business and may be better able to speak to some of the details there. But, that’s obviously a very large part of what we’re doing here at Lending Loop, using technology to make the underwriting process more efficient, and we use prediction models in a lot of ways in terms of even evaluating the likelihood of, say, offer acceptance, where we are actually generating scores that we are using to price models. Jin: So, I know you may be tired of talking about actual data, but just a couple more questions on it. What kind of data points do you provide on your borrowers? Cato: Obviously, we don’t provide everything to the lenders, but we try to give them a high-level summary. They see the business–who they are, what they are using the money for. So, they have some qualitative information–like what the business does, why they’re safe to lend to–a kind of explanation of the financials. They also get to see the income statement and balance sheets. They actually see the financial statements for the companies that are looking for financing \, and then they can also see information like what the loan is secured by–if there are any partial guarantees on the loan, or if there’s a general security agreement attached to the loan as well, and some other things. Jin: So, it’s fairly detailed information about each business. Jin: And do you provide an API for all that data? Cato: We don’t yet–it’s a very good question. It’s certainly in our plans to do that, to make that available–and not just for data on the borrowers, more for our own data. I think we are very much a company that believes in transparency and right now, we’re just showing it through a statistics page, so, a page that we generate which shows all the information on loan statistics. But, we definitely plan to make an API available at some point in the future. Jin: Now, that’s how you assign a risk rating and how do you go from that to assigning an interest rate, because, from what I understand, you guys assign the interest rate; the lenders don’t? Could you just talk about how we jump from credit rating to interest rate? Cato: They’re really tied together, the credit rating and the interest rate. Essentially, the interest rate is just a reflection of the credit rating, then it’s simply generated based on the information about a particular business and then also reflective of things of the economic environment. So, that’s really the only delta between why two visitors may have a different interest rating, but the same credit rating. It may simply be based on the time of borrowing, for example, and what the actual conditions were at the time of financing. Generally speaking, we actually have a grid. So, you can generally see what the corresponding rate of interest is. So, for an A+ class, I think it goes from around 5.9 percent to around 7.5 percent, and A would be from 7.5 to a little over 9 percent, and so on and so forth. That’s kind of the way that the interest rates are assigned, and then how that gets translated from the risk rating. Jin: I see. So would you say that the maturity has no bearing on interest rate then? Cato: The maturity absolutely does, but it has more of a bearing on the actual risk rating than on the interest rate. The maturity impacts what the risk rate of the loan is–if the business has a longer-term loan or a shorter-term loan. That risk impacts on the initial assessment that takes place when the risk rating is assigned to the business, and will have an impact on the rate that we then assign to the business. Jin: It is somewhat analogous to mortgages. I think, although I forget where, in some part of The States you can actually pay off a mortgage early, and mortgage lenders don’t like that, so they call it pre-payment risk. So, they also mess with interest rates to deal with pre-payment risk. But, your loans only go up to five years, so maybe it doesn’t really matter that much? Cato: It’s much shorter duration, and the other thing here is that, I would say, with regard to pre-payment risk is that there isn’t really any pre-payment risk because of the way our platform works, because you can re-allocate money almost instantly. So, the real issue with pre-payment, generally speaking, is idle capital--so under-used capital once you get paid. Because of the way that instant payment works, it’s actually eliminated the whole issue with pre-payment risk. So, as an investor, you actually want to get pre-paid because it’s validated the initial return that you’ve earned from that business. You no longer have risk with that business owner, and, because of the amortizing nature of the loan, you are getting capital and interest back every month, so, it can be beneficial actually to get pre-paid for these things. Jin: Can people lend to businesses through TSFAs or RRSPs? Cato: It’s a good question. Unfortunately, not right now. It’s definitely something that we would like to offer in the future, but, right now, it’s only through individual accounts. We are, actually, in the very near future, going to be opening it up to corporate lending accounts as well. So, if, for example, you have a holding company that’s going to be another potential way that investors can use Lending Loop. And, like I said, TFSAs and RRSPs are not supported right now, but it’s definitely something we should be doing in the future. Jin: And what happens if the business–the borrower–doesn’t pay the money back? Cato: It depends. Sometimes, we’ll do collections ourselves–for example, if there’s clear asset security and we can use a lawyer, and, potentially, then liquidate any assets that we have security over. Otherwise, we may also appoint a collections agency. So, we may use a collections agency to go in on behalf of the client base. Jin: Oh, I see, Okay. What are there fees involved, then, from the perspective of lending to businesses? Cato: The only fee that we charge is a servicing fee. That fee is the annual fee of 1.5 percent, and that fee basically reduces the effective yield on the note. So, if you think about it in simple terms: if a business is paying 11.5 percent, we take a 1.5 percent spread, so the investor will receive 10 percent. We only charge that fee on successful retainment, so, there is no fee to open an account – no AUM fees, no asset management fees. We only collect fees on the successful repayment of accounts by borrowers of loans and so that kind of keeps their revenue aligned to the lenders, because, obviously, we are only generating revenue when the investors are generating revenue, and, obviously, we don’t take any fees if there are any missed payments or anything like that. Jin: Lastly: you already talked about APIs being potentially new features. Are you working on something else that you would like to share? Cato: Yes. The other big release coming up fairly soon is corporate lenders–so being able to invest through a corporation as opposed to only through an individual account–that’s the big thing we are currently working on right now. And then, as well in the future, there’s lots of changes on our road map–a lot of them are informed by the feedback we get from our lenders. We have almost 11,000 lenders now signed up for Lending Loop. And, a lot of them give us great ideas and feedback on how we can improve the platform, so, we really leverage our customers to help us inform what we will be working on next. But, we definitely have a lot of things in the pipeline, and exciting things to come this year and, probably, next year. Jin: 11,000 is a very healthy number after 2 years. Cato: Yes, and it’s growing pretty quickly to, so, we are just trying to get the word out there obviously. I believe that this is a really attractive way for Canadian investors to have an attractive fixed income return and we really want to get more people aware of what we are doing and how they can get involved in peer-to-peer lending in Canada. Jin: Well, thank you very much for your time. That’s really all the questions that I have. Cato: Thank you for taking the time to chat with me, and if you have any questions, please don’t hesitate to reach out. I would like to thank Cato for taking the time to answer my questions. I will share my own thoughts on Lending Loop as an alternative investment platform in an upcoming article.